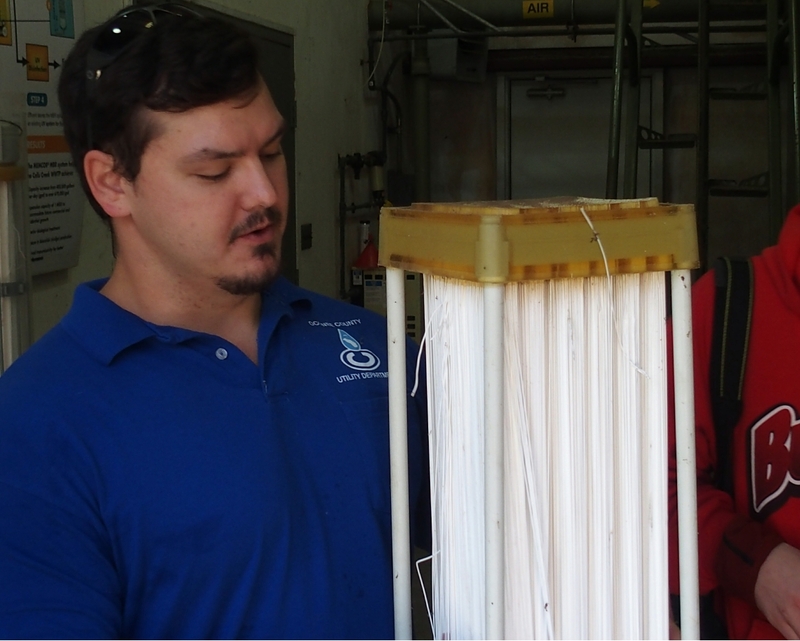 Oconee County on Tuesday night turned the page on its 12-year experiment with the use of membrane filtration at its Calls Creek Water Reclamation Facility. The Board of Commissioners voted unanimously to award a $440,000 design-to-build contract with Crowder Construction Inc. of Conyers for a new, replacement plant at Calls Creek estimated to cost between $6.7 and $7 million. Oconee County Utility Department Director Wayne Haynie said the new plant, which will use traditional biological processes, will produce water of the “same or better effluent quality” as the existing membrane plant, which relies on a technology borrowed from water treatment plants. Haynie told the commissioners that the membrane technology is both difficult and expensive to operate. Haynie said the membranes require rehabilitation every nine years at a cost of $1 million. Haynie told me in an email message this morning that the first permit the county received for use of membranes at the Calls Creek plant was in 2004. He believes the plant started operating the membranes a year later. Gary Dodd was Utility Department director at that time, and the county’s commitment to membranes, considered an innovative approach to wastewater treatment, continued through the end of 2014. Chris Thomas, a protégé of Dodd and Utility Department director until June of last year, had recommended to the commissioners early last year that the county revert to a traditional biological treatment approach at the Calls Creek plant. Thomas resigned in June after a series of problems at the Calls Creek plant. A consultant hired by the county said that the plant was not being maintained and that the membranes were not working correctly. At a tour of the Calls Creek plant Haynie organized for citizens on Dec. 12 of last year, Paul Ludwig, wastewater operator, told the visitors to think of a membrane as a straw. The membranes are bundled together into modules, which are submersed in sewage water. The water is then sucked into the individuals straws, leaving everything but purified water behind. The purified water coming out of the straws or module is the effluent from the plant. Ludwig said that while others also have experimented with the use of membranes in sewage treatment, most have turned back to the more traditional biological treatment because of the expense of maintenance. The Calls Creek plant was designed to combine biological treatment with membrane filtration, and Erin Carlton, hired by the county as wastewater utility supervisor following the problems of last year, said during the Dec. 12 tour that he was “having difficulty understanding” how the two pieces fit together. Haynie on Tuesday night listed three sources of funding for the new plant, which is to be built over the next 12 to 18 months. The first source is $2.3 million in fees in hand that developers paid over the years when they purchased sewage treatment capacity from the county. The second source Haynie identified is $1.2 million in 2009 SPLOST funds available. The third source is the projected $10.2 million in 2015 SPLOST. The county only started collecting these revenues in October of last year, so these monies are not yet available. He also said he heard from the Finance Department that the 2009 SPLOST balance is “higher” than the $1.2 million he had earlier been told was available. The Board of Commissioners originally had set aside just less than $6.9 million in 2009 SPLOST for water and sewer projects, but it then diverted $2.1 million of that amount to pay off the debt from the county jail. The most recent report on 2009 SPLOST spending said about $1 million had been spent of that $6.9 million by June 30 of last year. “That money will be well needed and well spent,” he said. On Tuesday night Haynie also presented the Board a series of policy changes that he is proposing, including the allocation of 40 percent of “available capacity” to residential, 40 percent to commercial, and 20 percent to industrial and manufacturing use. He also proposed that the county hold back 10 percent of the “plant treatment capacity” for reserve, and Commissioner Luke encouraged him to make that figure 20 percent. In addition, Hayne put forward a policy for deciding how the county would deal with what are called “dormant” construction or development projects. He proposed creating a waiting list based on a number of criteria, including whether construction had begun based on plans approved by the county. County Attorney Daniel Haygood advised the Board not to take any action on the policy recommendations pending further review. He said they would require an actual change of the county’s ordinance rather than a simple vote of the Board on the recommendations. Haynie’s comments on the quality of the effluent from the new plant came in response to a question from Tony Greco, 1071 Winthrop Place, on Calls Creek in the Hickory Hill subdivision east of Watkinsville. The full video of Haynie’s presentation to the Board as well as of his response to questions posed to him by the public and by Board members is below.